One of the keys to this new direction was the hiring of John Carollo, a former member of the Houston Nighthawks and a storehouse of design knowledge. Not only would he be responsible for the direction of the color guard, but it would be through his concepts that would fuel Lone Star’s sudden rise in the next few years. The corps uniform that John designed would be a unique concept within drum corps. He designed a unique but very flexible and functional corps uniform, consisting of black trousers and shoes, black gloves and gauntlets, black Vanguard style hats, and white jackets with no accents. Every year, overlays and accents for the uniforms would be specially created to enhance both the uniform and the show. John’s idea was to pick three colors that would be used throughout the show as a way of tying the various elements of the show together. From there, an icon would be created to represent the show concept. This icon would find its way on the uniform and throughout other parts of the show. The show chosen for this breakout year was the soundtrack of Disney’s Beauty and the Beast. It was determined by the staff that the approach of the show would not be a literal one. Instead, the drill, the colors, and the music would tell the story of Belle and the Beast in a different approach. A multi panelled stained glass window was used both as a symbol of the show and as part of the uniform. Other key staff members were added. Chris Neal, an alumnus of Black Gold had a keen ear that was able to give the hornline a more mature sound than what they should have. Brent Unger, from Star of Indiana, assisted with the instruction of the middle horns and marching. Robert Lazenbery was a well-liked drum tech who in many ways became the corps' biggest cheerleader. After a productive winter program, a 32 member corps came out to perform on tour. This corps was noted for its large drumline (6 snares, 2 tenors, 5 basses) and contra line (5). Archie Endley created a brass book that played to the strengths of the horn line and allowed the horn line to sound three times its size. Denny Jones and John “Coach” Rindom created a drum book that was both amazing and demanding to its members. One judge commented that Lone Star had one of the three hardest drum books in all of DCI. The drill design of Robert Poulin and the show design of John Carollo were the talk and darling of DCI judges on its originality and its concepts. The various other instructors in the corps pushed and polished the members into a unit that any corps director would be proud of. The corps no longer found it's home in Wichita Falls, resorting to rehearsing at places like Henrietta H.S., Lorena H.S., and Waco H.S. Inside jokes with the corps included "Ladies and Gentlemen, DCI's first homeless corps..." and "From I-35 Texas..." In spite of this uncertainty, the corps flourished. Lone Star also became one of the founding members of a new regional drum corps circuit, called Drum Corps South, which was a former part of Drum Corps East. A successful Drum Corps South tour, an interesting freeday at the NASA base in Alabama, and Drum Corps International tour led to the DCI World Championships at Jackson, MS. The corps placed ninth at the DCI Division III Prelims with a score of 72.4. The hornline took second place in brass performance and 4th in brass overall. 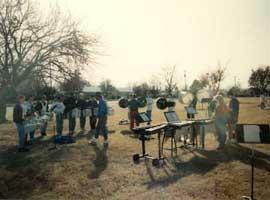 Instructor Robert Lazenberry rehearsing the drum line at winter camp.